October 10, 2017, 8:55 AM · In an effort to promote the coverage of live violin performance, Violinist.com each week presents links to reviews of notable concerts and recitals around the world. Tessa Lark performed works by Korngold, Ravel, Franck and Lark herself in recital with pianist Ellen Hwangbo. Albany Times Union: "Lark is an accomplished and expressive artist worthy all the fuss." Gil Shaham performed the Tchaikovsky with the Boston Symphony Orchestra. Boston Globe: "His approach to the popular concerto had hints of old-time fiddling in the breadth and zest of his tone. His intonation was out of synch with the orchestra at points, and some moments of crucial build in the solo line became plateaus, but one couldn’t have asked for a more rip-roaring cadenza or thrilling finale." The Boston Musical Intelligencer: "Tchaikovsky’s Violin Concerto certainly stands as a dusty old crowd pleaser, but Shaham managed to transform it into a thrilling and joyful revival." Arabella Steinbacher performed the Brahms with the National Symphony Orchestra. The Washington Post: "Steinbacher...(brought) firm assurance to her reading, though I would have welcomed more clarity in some of the rapid passages." Washington Classical Review: "The technical side of her playing was formidable, making for an exciting finale, paced just fast enough to be playful and folksy." 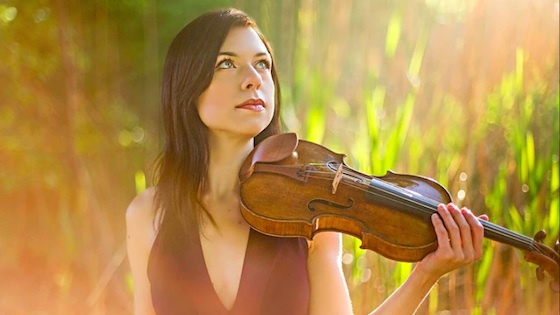 Anne Akiko Meyers played Ravel and Saint Saens with the the Vancouver Symphony. Northwest Reverb: "She conveyed the emotional depths of “Tzigane” and the charming elegance and fire of the “Introduction and Rondo Capriccioso." Nicola Benedetti performed the Elgar with the Royal Scottish National Orchestra. The Herald: "There may be virtuoso content aplenty in the solo part, but it was the intensity of the dialogue between her final movement cadenza and the combination of strummed and bowed notes across the sections that was unforgettably breath-catching." Dennis Kim performed the Glass with the Buffalo Philharmonic Orchestra. The Buffalo News: "Kim was particularly affecting at the start of the slow movement, articulating his scant, austere lines with understated emotion." Augustin Hadelich performed the Mendelssohn with the San Francisco Symphony. Berkeley Daily Planet: "Throughout this concerto, Hadelich had me moving in and out of the work, questioning what I was hearing from him." The San Francisco Chronicle: "I’ve heard Hadelich play with much more robustness and rhythmic freedom than he showed on this occasion, in which even the slow movement sounded a bit thin and reedy." Jonathan Carney performed Bruch's Scottish Fantasy with the Baltimore Symphony Orchestra. The Baltimore Sun: "Concertmaster Jonathan Carney took on those challenges in his usual intrepid form. If he lost clarity of articulation in some of the trickiest passages, he maintained vivid expressiveness throughout." October 10, 2017 at 05:56 PM · Oh I adore Tessa Lark! Going to see Patricia Kopatchinskaja this evening, should be a wild ride! October 10, 2017 at 06:47 PM · I hope that was just an off-night for Augustin Hadelich. I've seen him three times and he has always played really well, and I'm going to see him in three weeks. Maybe soloists tour too much? October 10, 2017 at 08:36 PM · Here's another review on the Hadelich performance by San Francisco Classical Voice. This one is by a violinist though, so maybe holds a little more water. October 11, 2017 at 11:46 AM · I was at the October 5th NSO concert and saw Arabella Steinbacher play the Brahms. She was fabulous. Her technique was flawless, and she was very expressive. October 12, 2017 at 06:34 AM · Hadelich has such gorgeous musicality, I'm inclined to think that he took a classical approach that the reviewers just did not understand.